I always liked radish in Huli. Infact, it was always on my request list when I went to visit my grandmother as a child. But, I learned to appreciate radish as a vegetable only after eating this dish prepared by my mother- in-law. At home, here in Mumbai we follow a pattern of breakfast, lunch and dinner. At my in-laws it is two main meals with a snack in between. Each morning, my mother in law walked downstairs, neatly dressed in her silk saree, prim and proper as always and after performing her morning puja, stepped into her neat kitchen, surveyed the pre-preparations made by her assistants and proceeded to cook an elaborate meal. 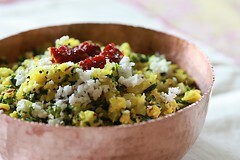 It consisted of 2 vegetable dishes, a salad, chapatis, rice and dal. She and my father-in-law then ate this meal on the elegantly laid table. She then collected her bag and files, stepped into the car and was off for the day before she came back and cooked the evening meal. After having run down the family business her day is not as packed as earlier but their routine and discipline continues to be the same. When ever I visit them, I ask her to make this vegetable which is one of my favourites. You could eat this vegetable with rotis or chapatis or rice. 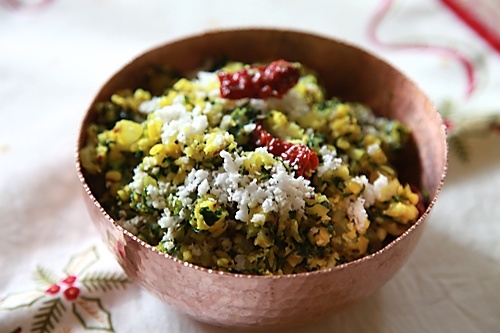 One of my favourite ways to eat this is with yogurt rice, popularly known as curd rice here in India. The cuisine of North Karnataka and Western Maharashtra is quite similar since both these states are separated by a thin border and that is why the inhabitants of the areas close to the border speak the languages of both these states, Kannada and Marathi. My maternal grandmother and my in-laws come from these places as well. 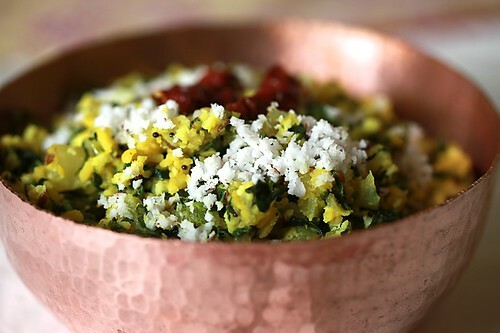 My mother-in-law learned to make this from her mother and I learned this from her so this is a family recipe that is quite close to me.The radish greens add a perfect touch of colour, tang and taste and the radish and mung dal perfectly complement each other. This is a true example of how simple ingredients bring out the real flavour and taste of vegetables. 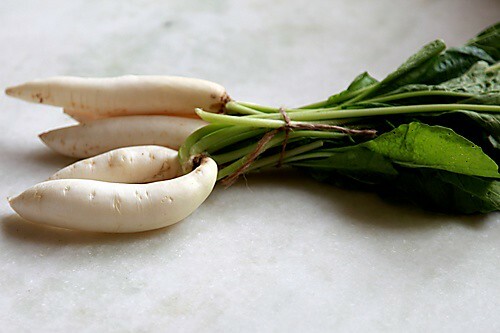 If you don't have the radish greens, you can substitute with fresh coriander or cilantro.It is worth getting the radish greens for their specific taste and texture. 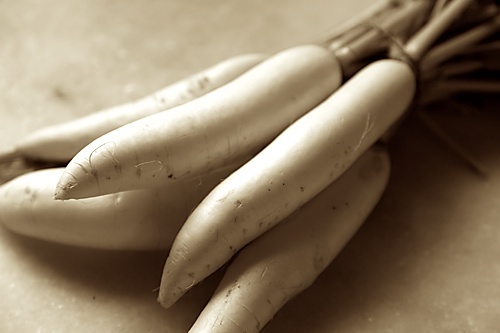 The white radishes could be substituted with pink radishes too. You can steam the radishes before cooking it to speed up the process. You might have to add a little water to the pan to prevent the vegetable from scorching or sticking to the bottom of the pan. This is as delicious as it is simple! I could even eat it as it is. 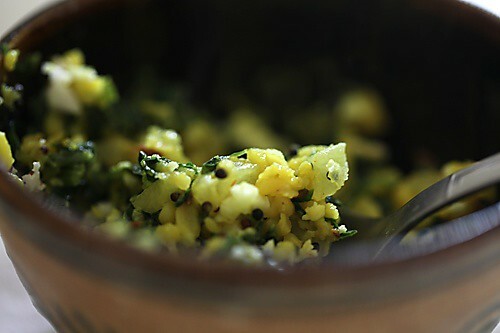 You will enjoy this simple dish Kulsum. This dish looks wonderful. Your mother-in-law seems to be a lady who wears many hats. lovely blend of spices n radish/greens ! Looks gtr. I will definitely try this one. Actually I just saw this subji @ my friend's house last week with a slight change, i.e instead of mung she had used channa. (She is a Maharastrian).Like u I always prepare huli from this raddish and now I got this healthy recipe, which I guess is better than the channa dal version.Thanx….